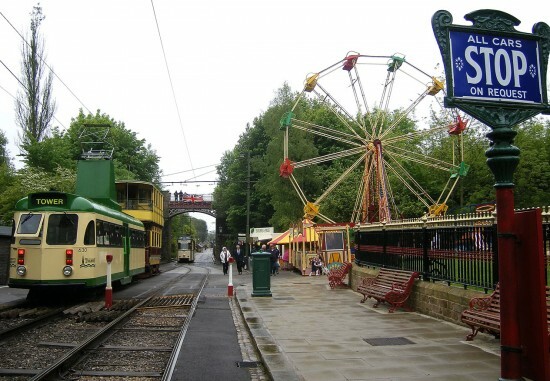 Blackpool Balloon 711 has become the latest tram to run at the Crich Tramway Village following its launch on the first day of the “Beside the Seaside” event on Saturday 24th May. The weather on this day was certainly not the weather you would want when visiting the seaside (although it probably was typical UK Bank Holiday weather!) 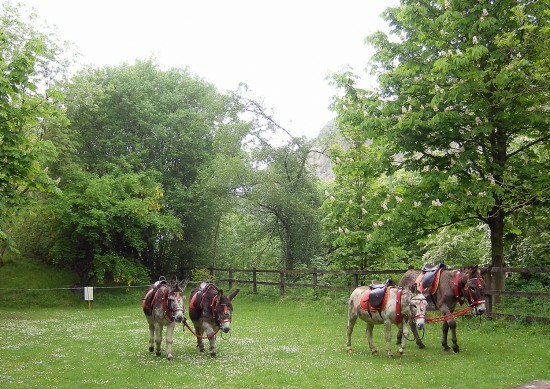 with rain for most of the day but the sun did put in an appearance as the day drew to a close. 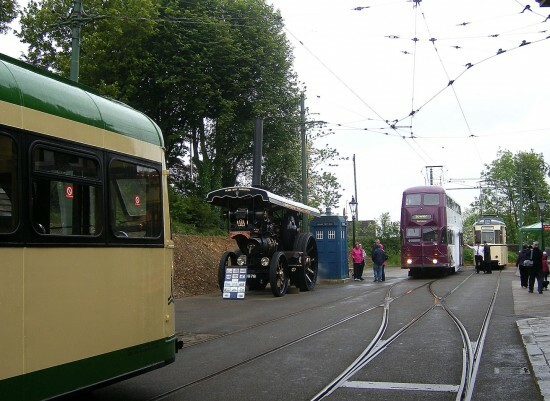 711, which becomes the second Blackpool Balloon Car to run at Crich and the third to be on site (or is it the fourth? 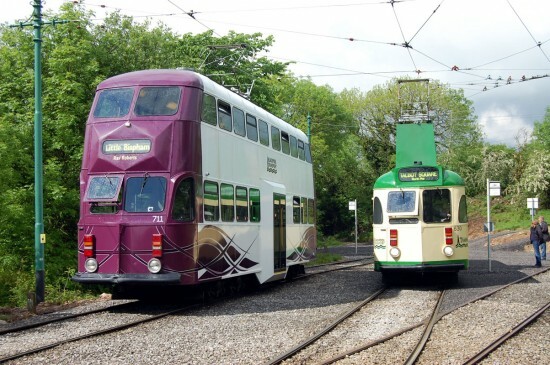 ), arrived at the Museum in early April for a short term loan until the end of the 2014 season and since then has undergone commissioning in the Workshops followed by extensive testing on the operating line ahead of its planned launch at “Beside the Seaside”. No major launch ceremony was planned but 711 was added to expected pool of trams available for the event in the weeks leading up to its start and so at approximately 1100 on Saturday 24th May the Modified Balloon departed Town End with a few expectant passengers on board – the first Balloon to carry passengers at Crich since the mid 1980s when 710 was on loan. Since its first outing in service 711 has operated most days during Beside the Seaside and is expected to also be used on Friday 30th May although will not be used over the last two days of the events (Saturday 31st May and Sunday 1st June) as a 1950s/1960s theme is to be in evidence and it is considered that 711 is too modern for this. 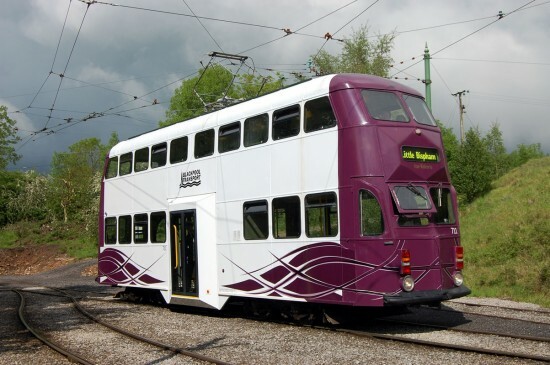 It is however expected to be in display alongside Blackpool Jubilee 762 on the depot fan. 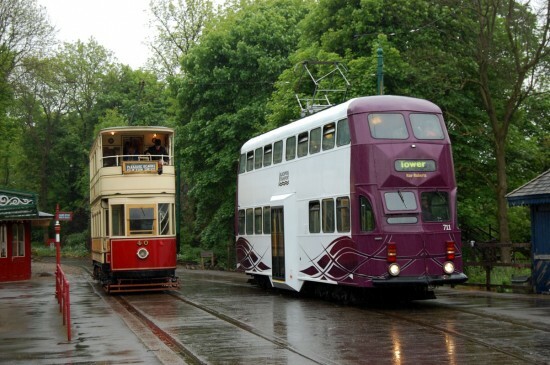 As well as the obvious highlight of the entry into service of 711, “Beside the Seaside” has seen at least three trams in service each day (with Blackpool trams popular choices although the slightly inclement weather has meant at times non-seaside trams have had to be chosen) whilst there has also been a historical fun fair, donkeys and even a beach to keep everyone entertained during the Half Term week. “Beside the Seaside” continues until Sunday 1st June. 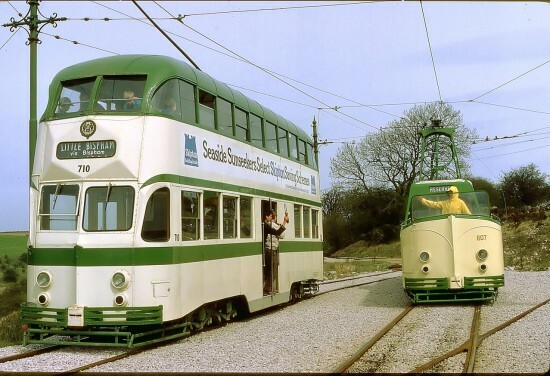 British Trams Online will provide LIVE coverage on Saturday 31st May and there will then be extensive photographic coverage on the main website at some point. 711 passes fellow Blackpool tram Standard 40 at Wakebridge on launch day. The sunshine broke through later on in the day as evidenced in this photo of 711 at Glory Mine. Also on 24th May we see 711 sitting at the stop at Town End awaiting its first passengers with 630 waiting to move forward and a Fowler steam engine. Blackpool 630 and the unusual choice of Chesterfield 7 at the Bandstand with a big wheel for company. We went yesterday and 711 threw a hissy fit taking a small section of line at Town End with it. Fair play to the museum staff who kept things moving in the Miserable weather with Leeds 399 and Blackpool 630. Is that why trams were only running on the down line in the aftermath?